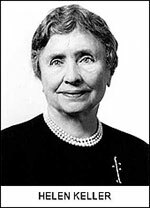 Helen Keller - Amarillo Downtown Lions Club Inc. Try to imagine how you would feel if you were suddenly stricken blind today. Picture yourself stumbling and groping at noonday as in the night; your work, your independence, gone. In that dark world wouldn't you be glad if a friend took you by the hand and said, "Come with me and I will teach you how to do some of the things you used to do when you could see"? That is just the kind of friend the American Foundation is going to be to all the blind in this country if seeing people will give it the support it must have.